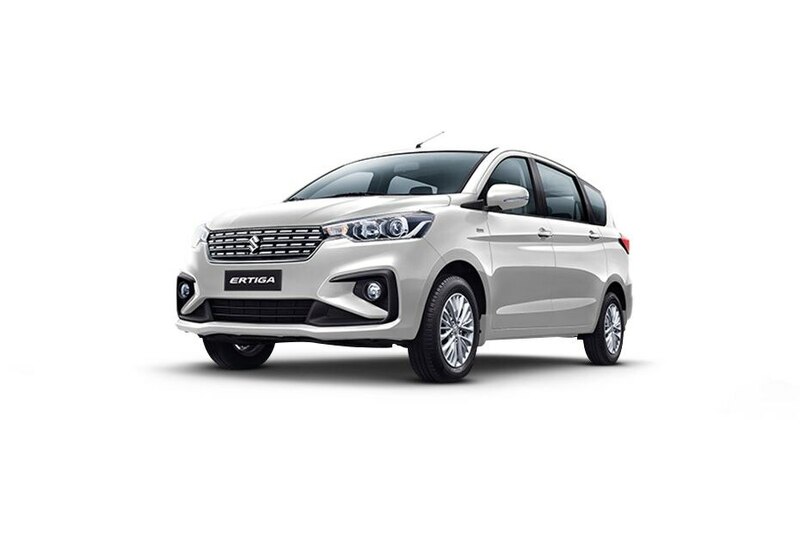 Maruti Suzuki launched the second generation model of the Ertiga MPV in November 2018. The updated model receives a comprehensive design overhaul, along with a new petrol engine option. The second-gen model is based on the new HEARTECT platform, which also underpins the Baleno, new Swift and new Dzire. The MPV measures 4,395mm in length, 1,735mm in width and 1,690mm in height and has a wheelbase of 2,740mm. The new Ertiga has been given a sharper design theme, especially in comparison to the outgoing model that looked a lot more bulbous. Sharp character lines running through the doors and tailgate make the MPV look a lot more dynamic than the outgoing version. The Ertiga continues to come with a dual-tone dashboard with a black upper half and the beige finish for the lower half. Faux wood and piano black inserts have been added for livening up the cabin. The three-spoke steering wheel on the new generation Maruti Ertiga is similar to the one seen on the Swift and Dzire. It comes with a leather wrap and wood insert on the ZXi and ZDi variants. The flat bottom steering wheel looks and feels good to operate. It gets tilt adjustment, but lacks telescopic (reach) adjustment. Steering-mounted buttons for the audio system and telephony are available from the V variant onwards. The left spoke gets integrated buttons for controlling the infotainment system, while pull-type controls for telephony are located below the left spoke. The front grille seamlessly merges with the headlamp assemblies on either side. It gets chrome inserts from the VXi/VDi trim level onwards. Meanwhile, the entry-level L variants get silver painted inserts. The Suzuki badge is placed at the centre of the grille. All variants of the new-gen Ertiga come with projector headlamps. Sadly, the projectors are halogen units, rather than LEDs. There are no daytime running lamps (DRLs) on any variant. The Ertigaâ? ?s instrument cluster gets a twin-pod design with the tachometer on the left and the speedometer on the right. Warning lights are located inside the tachometer pod. Diesel models get a monotone MID (multi-information display) screen, while petrol variants come with a coloured TFT MID screen. Maruti designers know that a majority of Indian customers consider chrome to be a premium material. As a result, there are multiple chrome parts all around. Pictured here are the chrome exterior door handles and window line that are available in Z and Z trim levels. All four power windows (front and rear) are standard on the new-gen Maruti Ertiga. Only the driver side window gets auto down functionality. ORVMs can be adjusted as well as folded electronically on V, Z and Z trims. Body coloured outside rear view mirrors (ORVMs) are available on all variants of the Maruti Ertiga, except the entry-spec L trim. The V and above variants also get electronically adjustable as well as foldable ORVMs. The B and C pillars are blacked out, while the A pillar is body coloured. The rear three quarter glass tapers towards the D pillar and ends nears the tailgate itself. This gives the MPV a floating roof look. Circular front fog lamps are available on the Z and Z trims. They are placed in large black housings with muscular c-shaped black plastic whiskers on the outer side. The number plate is located between the front grille and the lower air dam. There is ample use of beige on the inside of the new-gen Ertiga. The door pads, seat upholstery, pillars, roof and even the carpets are finished in the lighter shade. This helps in making the cabin look a lot more spacious than it actually is. The Ertiga comes with multi spoke 15-inch alloy wheels on the Z and Z variants. These wheels are wrapped with 185/65 profile tyres. The second row seats come with slide and recline functionality, along with 60:40 split as well. This is standard on all variants of the Ertiga and helps in using the available space with as much flexibility as possible. The third row seats can be reclined as well as split in 50:50 ratio. Also pictured here is the integrated cup holder on the side panel that can be used by the third row occupants. The first, second as well as third row seats come with adjustable headrests. This is a welcome feature because integrated headrests, available on some other MPVs in this price range, donâ? ?t offer the same flexibility in sitting comfortably. The V, Z and Z trim levels come with a foldable centre armrest. Meanwhile, a front sliding armrest with utility box is available between the front row seats on the Z and Z trims. Maruti Suzuki is offering the new-gen Ertiga MPV in five colour options: Auburn Red, Oxford Blue, Magma Grey, Silky Silver, and Arctic White.